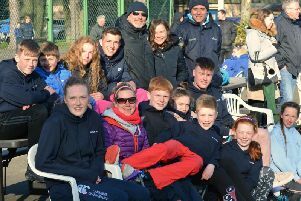 St Boswells owners Paul and Clare Rooney celebrated a 4-1 success before a bumper crowd at their local track yesterday. Sindarban carried their colours to victory in the Edinburgh’s Mathers Bar maiden hurdle race. The four-year-old, returning from a three-month break, stayed on strongly to take the spoils. Winning jockey Brian Harding went on to complete a double, when Simply Ned retained his 2014 title in the feature NSPCC School Service handicap chase. “That was a proper race and he has done really well to give so much weight to Robin´s Command,” said winning trainer Nicky Richards. “I´m not sure whether he gets two and a half miles and his next race will be the Shloer Chase at Cheltenham,” he added. Alnwick trainer Rose Dobbin, who saddled the runner-up, went one better in the following Walking The Courses handicap chase, when Donapollo scored by six lengths in the hands of Hawick jockey Craig Nichol. Touch of Steel produced a gutsy performance to land the concluding Radio Borders novices’ handicap hurdle race for Langholm trainer James Ewart and jockey Dale Irving. The winner carries the colours of Jedburgh owner Ann Fraser. Ten went to post in the opening Newcastle Arms Coldstream handicap hurdle race, where long-time leader Mighty Whitey was reeled in by Dynamic Drive in the closing stages. Maurice Barnes has his horses in great form and the winner was posting back to back wins, having scored at Hexham last time. Two went 12 lengths clear of the rest of the field in the Geoff & Elspeth Celebration novices’ handicap chase, with Present Flight going away from Derryfadda for a successful debut over fences. Trained at Milnathort by Lucinda Russell, the gelding was a winning spare ride for Derek Fox, stepping in for the sidelined Peter Buchanan. “The switch to fences, a longer trip and a wind operation have made the difference,” explained Lucinda. “We were a little worried that it wouldn´t work so it´s a bit of a relief,” she admitted. Owners Kilco (International) Ltd enjoyed an across the card double, also celebrating success at Huntingdon with Big McIntosh. Hello George made every yard of the running for a pillar to post victory in the Borders Employment Law intermediate hurdle race, giving jockey Richard Johnson his 88th win of the season. Racing was preceded by the ever-popular Border principals’ race, which saw a good field of 14 come under orders. The grey Lord Gillingham repeated last year’s success, this time carrying Kelso Laddie Fraser Hastie to victory. The pair took the spoils in an exciting finish, ahead of Lockerbie Cornet Ian Millar and Coldstream Right Hand Man James Balmbro. The riders are only teamed with their horses that morning. “I was excited to find I had him,” admitted 22-year-old Fraser, who works for Lloyd Landrover in Kelso. “It’s an experience I’ll never forget, and the final highlight of a great summer,” he added. Racing returns to Kelso on Saturday, October 24. 2.05 – DYNAMIC DRIVE (T Dowson) 13-2; 2, Mighty Whitey 17-2; 3, Endeavor 22-1. 10 ran. M Barnes, Cumbria. 2.35 – SINDARBAN (B Harding) 4-1; 2, Bowdlers Magic 7-2; 3, Summer Storm 11-8 fav. Nine ran. D McCain, Cholmondeley. 3.15 – PRESENT FLIGHT (D Fox) 7-1; 2, Derryfadda 3-1; 3, Longvueville Flier 5-1. Seven ran. L Russell, Milnathort. 3.50 – HELLO GEORGE (R Johnson) 4-6 fav; 2, Cooking Fat 12-1; 3, Welcome Ben 14-1. Eight ran.P Hobbs, Somerset. 4.20 – SIMPLY NED (B Harding) 6-4; 2, Robin’s Command 7-2; 3, Croco Bay 8-1. Six ran. N Richards, Greystoke. 4.55 – DONAPOLLO (C Nichol) 7-2; 2, Solway Bay 4-1; 3, Generous Chief 7-1. Six ran. R Dobbin, Northumberland. 5.30 – TOUCH OF STEEL (D Irving) 2-1; 2, Destiny Awaits 4-1; 3, Miss Joeking 12-1. Five ran. J Ewart, Langholm.